Discussion in 'Automobilista - Links & Resources' started by Renato Simioni, Mar 8, 2016. Hello Simracers! We are Clube do Volante, a racing community from Brasil! Olá pilotos! Nós somos o Clube do Volante, comunidade voltada aos simuladores situada no Brasil. This time it will be formula V10. We will be using real tracks and liveries as it was in 2002 season. We will not drive all tracks in real series calendar. It would be pretty long league. Sign up for the league here, in this thread. Choose a Team and Driver. Once you picked up a driver you will have to drive with him whole season!! Also race will be every WEDNESDAY when league start. Will more than 8 years of SimRacing, our league (Racing-France) is proud to to announce you that we are totally moving over Automobilista. To celebrate this new turn, we are scheduling on September a public race weekend with a car and a track that will be defined later. Prizes will be offered to participants that take place in the whole race weekend. As our team is totally moving over this simulation and as we will organise events over the years I hope that Reiza team will be supporting us (terms still need to be discussed). GPLBR will be hosting a Formula Extreme Mundialito based in the last part of the 2016 Formula One season - already starting next Monday (29). Races will be held every Monday after F1 Sundays - as long as the track is available and compatible with AMS 1.0. Qualifying session starts at 9:45pm (GMT-3). The championship is open to every one, so feel free to join us! You can find more information in our Facebook page or in the Mundialito page. wir sind eine Kommune Rennsimulation-begeisterter Menschen und haben einige Rennsimulationen und Rennspiele "im Angebot". Wir bereiten gerade eine Automobilista-Liga vor. Wir suchen gleichgesinnte, freundliche Menschen, die in einer Gruppe zu mehreren "regelmäßig" fahren möchten. Wir sind deutschsprachig und nutzen TeamSpeak (3). Die Zielsetzung ist Punkterennen ohne Fahrhilfen (außer automatischer Kupplung) zu fahren, und so wird der Server für Fun-Events konfiguriert, aber sonst sind niedrigste Traktionskontrolle und niedrigstes Antiblockiersystem aktivierbar. Wenn ihr gerne mehr möchtet und interessiert seid, schaut vorbei und gebt uns eine Nachricht. Wir hören auf euch (und setzen den Wunsch der Mehrheit um)! we are a community of humans enthusiastic about racing simulations and "we offer" some racing simulations and racing games. 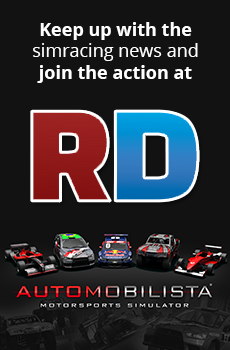 We are currently building up a league of Automobilista. We are looking for like-minded, friendly humans, who like to drive "regularly" in a group. We are germanophone and use TeamSpeak (3). The ambition is to drive without assists (except for automatic clutch) for leaderboard races and this is how the server is configured for Fun-Events but at other times lowest traction control and lowest anti-lock brakes are available. If you like to have more and if an interest has been sparked, come by and let us know. We are listening to you (and implement the wish of the majority)! Nos course en open on lieu les mardis et dimanches toutes les semaines,nos championnat se déroule les jeudis . Our open races take place on Tuesdays and Sundays every week, our championship takes place on Thursdays. We introduce here us as the first Italian community to make only competitions and exclusively to historical character, both with the F.1s. what the sports prototype and tourism. Free events and covered by Live streaming. Competitions to lilt every 15 days. We wait you to have a good time together us. 2) Anyone can propose a training or race in whatever server (ours or external). Feel free to join our group and races!!! Cheers! Total Race Brasil é uma liga de automobilismo virtual brasileira para o F-Extreme e Stock Car no totalracebrasil.com (site em construção). Se estiver interessado, por favor, consulte-nos e informe-nos através do chat em nossa fanpage. Total Race Brasil is a Brazilian virtual motor racing league for F-Extreme and Stock Car at totalracebrasil.com (site under construction). If interested, please consult us and let us know through the chat in our fanpage. Just found this, please welcome "HiPole"--most popular SimRacing league in China. Seen a lot of friends from Brazil coming and practising on our server lately, we use default mod cars mostly MINI, Catherham, MCR and a bunch of domestic circuits in Brazil. Hi @GuoDongbin , I have visited your site several times, it seems so interesting, and i would like to see the events and try to participate, but is not any way to translate it to english? I am not very skilled with foreign languages. Cheers mate and have a nice day! Glad to connect here dude, I'd say google translate is a pretty good tool to use and we've tried it earlier it seems easy to understand and accuracy is about 95%. Hey I noticed you're part of Reiza staff and if you are part of some SimRacing leagues there we can consider a race cross region for fun, how's that sound? Look forward to hearing from you soon. Cheers and have a great day! Nope , not Reiza guy. Only an admin of the 3 we are in our comunnity " AMS Unofficial". Yes is a very cool idea, we could talk by discord about that. See ya mate!